I visited this pool in a disused quarry at Clashmore (NC036316) on 13th April 2015 to make a collection for an old friend who studies desmid algae. The shallows were dominated in places by what looked like fuzzy green string. I recognised this as one of the stoneworts, large green algae found in still and slowly-flowing freshwater habitats, usually with a pH of over 6. 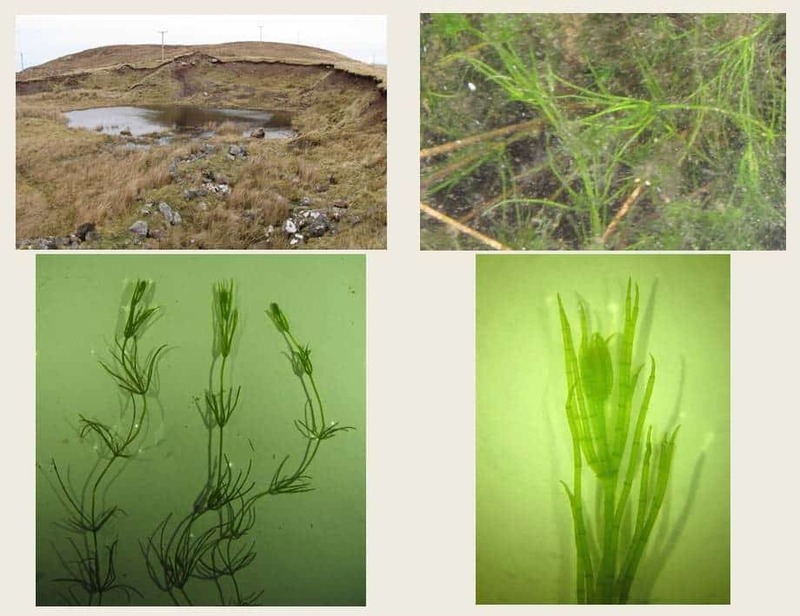 It keyed out to delicate stonewort Chara virgata, the commonest of the group in Assynt. Seen under the microscope, stoneworts have an elegant structure. The main axes are sheathed by long narrow cells, sometimes in a long spiral, and bear whorls of branchlets, which are punctuated by rings of tiny spine-cells. When they appear later in the season, the female reproductive structures, oogonia, look like miniature orange hand grenades. Beds of stonewort support a wide range of small animal life and are an important part of the food-web where they occur.